August 29— Traveling in Baby remains an adventure. Yesterday was no exception. We decided to go home. We were going to go home, anyway, but we decided not to go to Atlanta this trip. So, we programmed Garmina (our GPS device) for “home” and let her decide the route. I think there are various ways Garmina can be programmed to work—fastest route, most direct, Interstates, etc. We apparently have her programmed for the most direct route, which isn’t necessarily the fastest. She took us across Texas on highways (not Interstates). We eventually hit I20 and stayed in a rest area just inside of Mississippi, but we are pretty sure she’ll take us crosswise in Mississippi once we hit Jackson. We’ll see. We filled the diesel tank before we left Texas, but as we approached Mississippi it was time to look for a fill-up place. I checked prices on a bookmarked page (http://autos.msn.com/everyday/gasstations.aspx). It told me diesel was several cents cheaper at a Chevron station just before we crossed into Mississippi. We saw the sign for the station and pulled off. We cannot use all stations; some do not provide enough room to make a turn. (Remember: Baby is 38 feet long, plus we have “toad”—our car behind her.) This Chevron station didn’t even look like it had diesel…so Jim drove in front to see if it did and if he could get in and out. It turned out that the station had several diesel pumps for trucks on its far side, but by the time Jim discovered them, he had passed the station. He said he would turn around up ahead. Usually we can find a place. The road was asphalt for another 100 feet or so, then it turned into gravel. We kept following it, until it turned into a Y and climbed a rise. Jim decided to take the left turn…surely there would be a turnaround place up ahead! The road narrowed. We were actually on top of a levee, driving on a narrow one-lane dirt/gravel road. And there was no turnaround in site. Garmina actually knew about this road…sort of. She told us it went straight for a couple of miles, then turned back. We kept going, and going, and going…until we came to the Interstate. Of course, we couldn’t get on the Interstate. 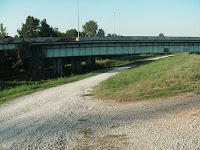 This was a levee road; we had to go under it. But the question was: Could we fit? Baby is close to 12 feet tall. Jim took a walk to see what lay up ahead. When he came back, he said he saw a place he thought we could turn. He was concerned, however, that Baby could get under the overpass. The police officer turned his truck around. I stood on the embankment and watched as Jim inched forward. Using my cell phone, I told him to keep going. Baby made it! We finally made it to the main highway. Always a first time, and never a dull moment with us.